Fixes an encoding issue related to asian characters. This change only affects new nodes. If you experience issues with existing nodes, please visit our support site for instructions on how to fix this issue. 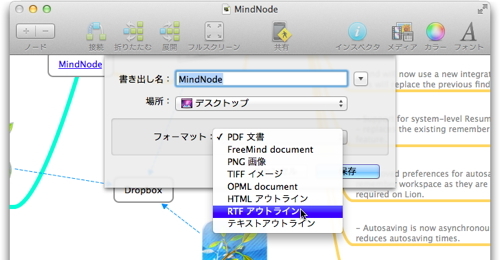 Fixes an issue related to opening documents with more than 200 images/attachments. Fixes a crash when immediately closing a document after opening. Support for the new native full screen mode. 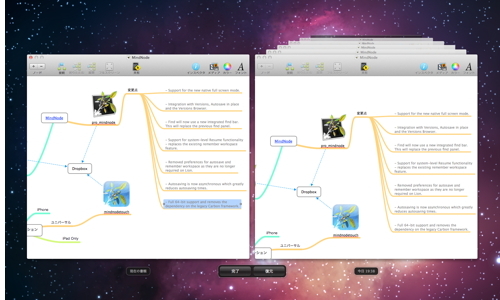 Integration with Versions, Autosave in place and the Versions Browser. Find will now use a new integrated find bar. This will replace the previous find panel. 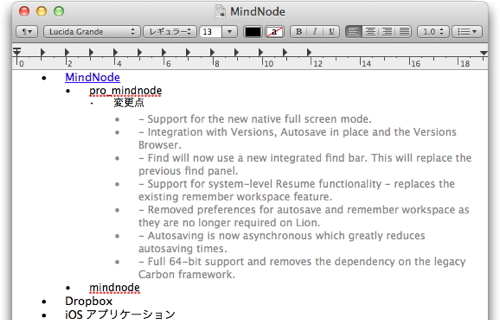 Support for system-level Resume functionality – replaces the existing remember workspace feature. Removed preferences for autosave and remember workspace as they are no longer required on Lion. Autosaving is now asynchronous which greatly reduces autosaving times. 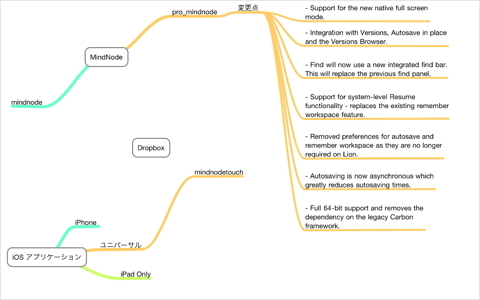 Full 64-bit support and removes the dependency on the legacy Carbon framework. 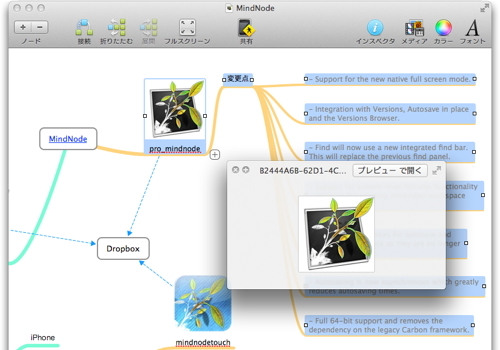 QuickLook support for embedded images. Completely rewritten image and attachment handling, optimized for fast save times and lower memory consumption. This also resolves a crash during saving, an issue where the save menu item could be disabled and a loading issue of documents with many images. 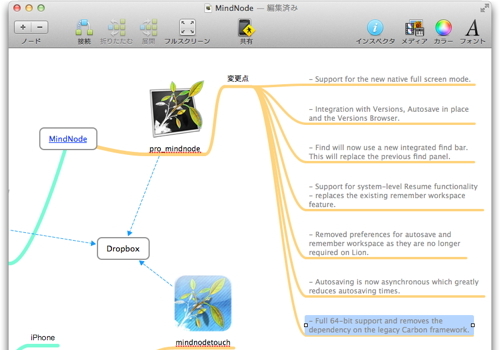 When copying PDFs into a document, MindNode Pro will now retain the full resolution of the PDFs and not scale it down. Resolves a problem with asian character input where the first character was swallowed. Reopen documents in the correct order when remember workspace is enabled. (Snow Leopard only).